Mophie has sold cases with batteries for a while, but its latest, introduced at CES 2019, has pushed the concept a bit closer to perfection. The $119 (around £95 / AU$170) Juice Pack Access is a model made specifically for the iPhone XS, iPhone XS Max and iPhone XR that doesn't block the Lightning port – even while it's charging your device. How? Wireless charging, of course (up to 10W). Which means that the case can itself recharge if placed on a charging mat. The case will always prioritize the phone first, recharging your device to full before refilling its own cells. While that’s a slower method of charging, the difference between direct charging via a plug and wireless charging isn't too severe – it might take an extra 30 minutes, and should refill phones in or just over three hours. But by leaving the Lightning port open, you can listen to tunes or use an accessory while your phone charges up – and the case won't cover up your speakers, either. As for the case itself, Mophie designed it to have a little scalloped cutaway about three-quarters of the way up the back, so it’s almost flush around the camera. It’s a nice rest for fingers, though all but one of the color options have a nice matte rubber finish that should give some grip anyway (the gold is a hard plastic, but otherwise looks identical). 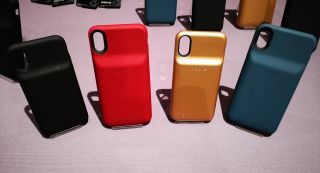 The case comes in three sizes, for the three latest versions of the iPhone, along with different colors for each. The models fitting the iPhone XS (which also fits the iPhone X) and iPhone XS Max come in black, gold, maroon and forest green; the case for the iPhone XR comes in black, bright red and a 'robin’s egg' blue. The iPhone XS Max case is obviously larger and packs commensurately more battery, but all models should charge at the same rate. The Juice Pack Access will be available some time this quarter, but official global pricing and availability is yet to be confirmed.